J.P. Leggett and C.B. Platt were both residents of Carthage, a county seat in southwest Missouri, when they formed their business partnership in 1883. 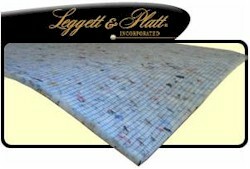 J.P. Leggett was an inventor and had several patents to his credit. When he developed the idea for a spiral steel coil bedspring, he went to his future brother-in-law, C.B. Platt, for his manufacturing capability and expertise. Together they produced the L&P bedspring, patented in 1885, which offered the best night's sleep yet available. Their partnership prospered and the business was incorporated in 1901. The company has operated continuously since then, and began its fifth decade of public ownership in 2007. The modern growth era for the company began in the 1960's, when an executive management team assumed leadership. Being substantially invested in Leggett stock, then and now, management developed a plan to enhance the potential for long-term growth. The strategy is a proven success, resulting in leading manufacturing, marketing and distribution capabilities. Today, we are serving more customers, with more products and growth opportunities than ever before.